It’s one thing to perform a play within a play. It’s another to perform a musical within a musical. Along with twice the acting, there’s also twice the singing and twice the dancing. Spokane Civic Theatre’s “Kiss Me, Kate,” which opened Friday, manages to carry the heavy workload as if it were as light as a feather. 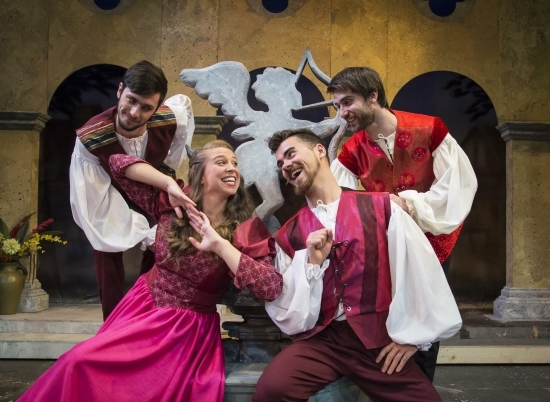 Both the volatile relationship between Petruchio and titular shrew Kate and the sweeter union of Kate’s more desirable sister Bianca and her love Lucentio in Shakespeare’s classic tale are mirrored offstage. The former is depicted by director/producer Fred Graham (Daniel McKeever) and Hollywood star/Graham’s ex-wife Lilli Vanessi (Tami Knoell), who play Petruchio and Kate, respectively, in “Taming.” The latter is portrayed by Lois Lane (Hannah Kimball-Fuller) and Bill Calhoun (Jonah Taylor). After an acrimonious divorce, Graham and Vanessi are at each other’s throats, trading barbs every chance they get, though with Vanessi reminding Graham of the anniversary of their divorce, it’s clear the pair still has feelings for each other. Whether as Fred and Lilli or Petruchio and Kate, McKeever and Knoell portray the love-hate (heavy on the hate) relationship with tangible venom and equally as felt adoration for their former love. Jhon Goodwin and Grady O’Shea, as Man #1 and Man #2, two armed gangsters who show up at the theater to collect on a $10,000 IOU Calhoun signed in Graham’s name, added comedic relief to some tense moments between Graham and Vanessi, simultaneously threatening Graham and praising Vanessi’s performance. The two eventually make their way on stage, looking like court jesters, and even have their own number, “Brush Up Your Shakespeare,” a highlight of the show. It’s difficult to pick a favorite song though, as Cole Porter’s music and lyrics, plus the impressive voices of the cast, especially the quartet of McKeever, Knoell, Kimball-Fuller and Taylor, make each song seem like the standout until the next one came along.